I was in a mall in Miami and thought of Ms. Kaiser whom I had seen on the local news not long before. My daughter and I were in a mall and I caught this…she had no idea what I was doing! 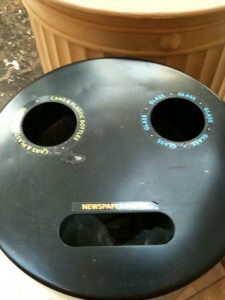 Ruth: People often wonder what I’m photographing and why I am interested in something like this recycling can. It’s a great opportuniy to tell the about Spontaneous Smiley!